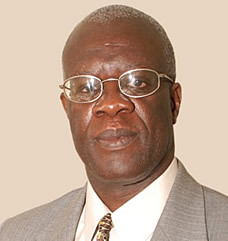 Professor of Medicine, trained in general medicine and internal medicine at Makerere University, Uganda and later in clinical epidemiology at McMaster University, Canada. From 1997, for 11 years, he served as the Medical School Dean at Makerere University, and since then has been Principal (Head) of College of Health Sciences. He is a board member for FAIMER, a Fellow of The World Academy of Sciences (TWAS), and an External Affiliate member of the Institute of Medicine (IOM). He serves on the IOM Global Forum on Innovations in Health Professional Education. He is the Principal Investigator on a multi-country research capacity building consortium involving seven African institutions and two universities in the UK, (Cambridge University and London School of Hygiene and Tropical Medicine). He is the Chair of an Africa-wide initiative for Strengthening Research Capacity in Africa (ISHReCA), the Director of the Medical Education for Equitable Services for All Ugandans (MESAU) – MEPI Consortium, and Chair of the African Medical Schools Association (AMSA).